The new guy hasn’t yet lived through a basketball season in Spokane when it’s all Gonzaga, all the time. But Donny Daniels is getting the idea. There are hints dropped every day – like having a reporter knocking on his office door in July, for instance. It may take some getting used to. Yes, he’s starting his 39th year in the college game as player and coach. Yes, he’s bunked in the penthouse. He was on the Utah staff that went to the NCAA title game in 1998, but the Utes aren’t even the dominant passion in their area code. He walked in John Wooden’s footsteps at UCLA, and yet in the glitzpool of Hollywood even Kobe and ManRam can be afterthoughts. But being the center of attention isn’t what lured Donny Daniels to Gonzaga. How Gonzaga remains the center of attention, well, that’s another story. “This place has always intrigued me as far as the sustainability – if that’s the right word to use – of the success of the program,” he said. When the smoke from today’s fireworks clears, college basketball’s July jackpot for recruiting is on, and Donny Daniels will be on a plane to where the players are – along with virtually every other Division I assistant coach in the country. The difference is, none of them are the most intriguing new face in his particular program. Gonzaga basketball is hardly resistant to change – the program wouldn’t be where it is without some dramatic shifts in vision. But it is also a shrine to continuity, and with some qualifications it can be said that Daniels is the first outsider to join the coaching staff in two decades. Tommy Lloyd moved up from an administrative assistant’s position. Leon Rice, whom Daniels replaced, and Ray Giacoletti had both been close with head coach Mark Few long before being hired. Daniels and Few go back, too, but as rivals on the recruiting trail. And in hiring the first African-American coach in the basketball program’s history, Few has also added a direct link to the deep, urban recruiting hotbed of Los Angeles. Of course, if that means a change for Gonzaga, it means one at least as big for Daniels himself. And when he decided to make this most dramatic of job changes, he did it with a nod to the stability here. For in what can be the most transient of professions, Daniels has been something of a stayer. He played at Verbum Dei High School in L.A., and returned to coach there. 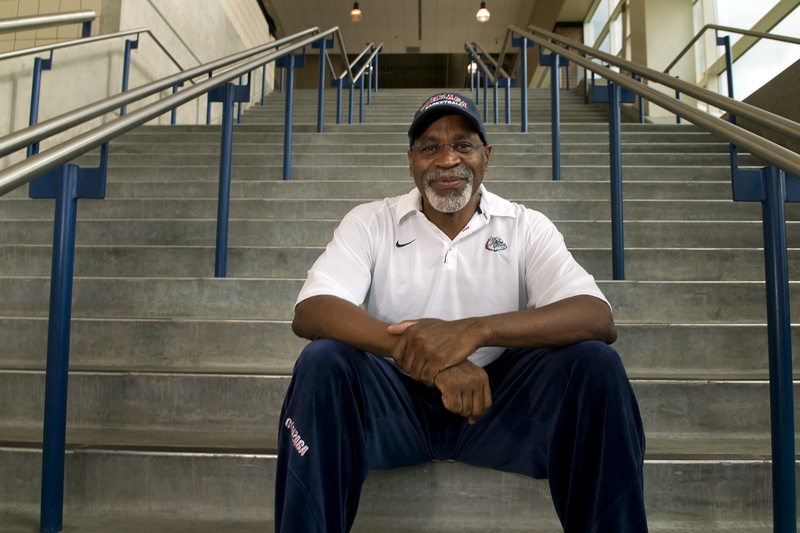 He played at L.A. Harbor College – and returned to coach there, too. He did five separate stints at Cal State Fullerton as player, assistant and head coach. He pulled 11 years at Utah, seven at UCLA. The appeal didn’t stop there. That three-year episode could have been considered the nadir of Daniels’ career. Sanctions docked him two scholarships, and he was prohibited from recruiting junior college players. Doubling the win total from five to 10 his last season was the closest thing to a highlight. Yet he refuses to think of it that way. The job at UCLA, in particular. There, he had to two encounters with Gonzaga that most Zags would like to forget – the 2006 NCAA tournament loss when the nine-point lead disappeared in the last 3:26 (“They should have won that game,” Daniels acknowledged), and the recruitment of guard Jordan Farmar, the loss of whom was a disappointment to Few. Yet even that was an endorsement to Daniels. And along the way, he’s discovered that it’s a pretty good gig. The bet is, at Gonzaga, he’ll know.